Like any long-running film franchise or TV series, it is interesting to note the ways in which the Bond series has acknowledged its longevity. While the 10th, 20th and 30th anniversaries passed by relatively quietly, with no films being released to coincide, the 40th anniversary was marked by Die Another Day, a greatest hits compilation with little narrative pull which was in hindsight downright embarrassing. Skyfall is a more confident and impressive offering all round, marking the 50th anniversary with a film which looks far back into the series' past while also making a conscious effort to appear modern and cutting-edge. The result is technically superb, with Sam Mendes bringing weight to the characters and the visuals being some of the best in the whole series. 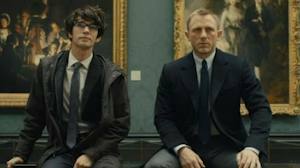 But the film also demonstrates how fundamentally little Bond has changed, something which is cause for both concern and celebration. 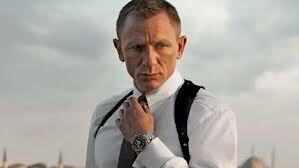 The Bond series has always been at its best whenever it has had to defend its existence. The previous attempts at reinvention - Casino Royale, and Goldeneye before that - were prompted by perceptions that the series was old-fashioned, caused respectively by the game-changing Bourne series and the end of the Cold War. But while these films are impressive technical exercises, which still feel in isolation like a breath of fresh air, the basic formula has remained more or less the same. The series has become so much of a genre of its own that any claim of reinvention or radical departure should be greeted with extreme caution. Bond has always assimilated ideas and stories raised in other films; it's one of the many ways the series has stayed relevant, or at least appeared that way. Skyfall continues to follow the trail blazed by Bourne by showing the extent of high-tech surveillance, and how advances in communications have changed the way that decisions are taken about people's lives. Both the villain and the revamped Q branch borrow from The Social Network, a film which argued that the world is now run not by governments but by technical wizards, and by extension how 'nerds' have grown from being perceived as harmless and weak into a force to be reckoned with. 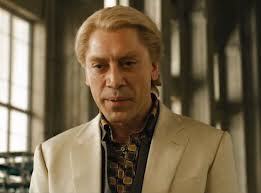 Skyfall also contains a number of prominent visual references to other films, past and present. The entire sequence in Shanghai owes a massive debt to Blade Runner: the shot of Bond's gun in moving close-up and the fight against the Japanese signage are eerily close to Ridley Scott's masterpiece. There are also touches of Inception present in the lift scene and on the villain's island, whose ruined buildings could have come straight from Christopher Nolan's Limbo. On top of all that, the film contains a great many nods to its own back catalogue. Much of the plot, while appearing original, hints back to conversations in Goldeneye. The allusions to Bond's parents are akin to the scene with 006 among the fallen idols, and the central duality is structured along the same lines: like Alec Trevelyan, Silva was betrayed by his homeland, and represents what Bond could have been had things turned out slightly differently. The appearance of the DB5 and the journey "back in time" to Scotland is a direct nod to the Connery era, Silva has a passing resemblance to Jaws from The Spy Who Loved Me, and there are two passing references to The Man with the Golden Gun, in Shanghai and with the shooting of the mirror at Skyfall. The key point here is that everything we see, we have seen before, either in the Bond series or in the many other films on which it draws. What makes Skyfall memorable is the way in which these ideas are presented or repackaged so that they appear either original or become distinctive to the character. Having an abundance of references was largely to be expected, considering the occasion that is being marks, and if nothing else the film scores over Die Another Day by actually having a coherent and interesting story. 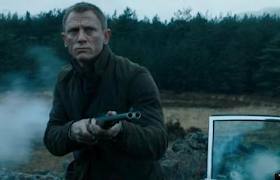 The central irony about Skyfall is that its story is very much anti-Bond, but it is being told in a by-the-numbers, classic Bond way. 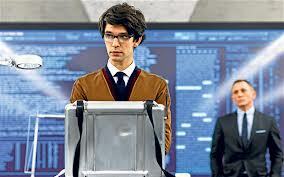 The story is a not-too-distant cousin to The Ipcress File or Tinker, Tailor, Soldier, Spy, insofar as it uses a troubled yet distinctly British protagonist to focus on the changing mechanics of the secret service, particularly the ways in which technology is altering or eroding the role of agents. This is reflected in the numerous scenes of M answering to politicians, the increasing dominance of Q branch and the conversations between M and Mallory. 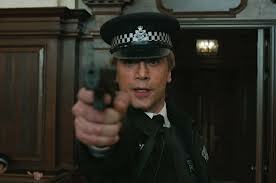 But whereas Tomas Alfredson went against the grain, openly eschewing the conventions of a spy thriller, Sam Mendes tells this story in the manner of the classic Bonds. We go through the same motions as all the Bond films after Diamonds are Forever: after a riveting pre-title sequence, Bond comes in and is sent on a mission. He snoops around with an attractive sidekick and/ or love interest, who despite seeming more forthright and independent still takes a back seat, in more ways than one. After several fights with secondary villains, he and the main antagonist meet and talk about the plot. There then ensues a cat-and-mouse chase over several locations, eventually resulting in Bond triumphing, sometimes with a deep personal cost. If we try to see Skyfall as a genuine reinvention of the Bond series, we will quickly come unstuck as these clichés keep coming. No-one has yet had the confidence to fully abandon Bond's gadgets, vodka martinis or inherent sexual magnetism; even when Timothy Dalton made him cruel and dangerous, the character was still placed within conventional surroundings. If, on the other hand, we see this as a genre exercise, whose mechanics we know inside out, then the film takes flight and becomes remarkable. It's like a well-directed production of The Mousetrap: predictable and silly, but presented so confidently that it becomes endearing. 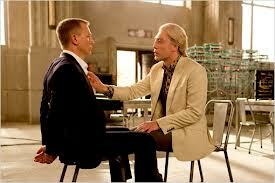 Taken purely as a Bond film, Skyfall is an incredibly well-made addition to the series. Despite its prominent references to other films, it is visually distinctive and spectacular. 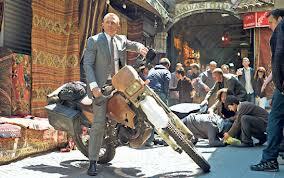 The film is shot by the fantastic Roger Deakins, who collaborated with Mendes on Jarhead and Revolutionary Road. He paints the film in a number of metallic greys and silvers, giving the action a polished sheen even in its most kinetic moments. Mendes' camerawork compliments him very well, relying less on Bourne-inflected hand-held work and more on longer, sweeping shots to establish the scale of the locations. 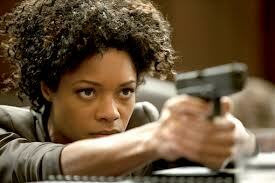 Mendes also comes up trumps in making us care about the characters. It's tempting to just view them as archetypes and therefore let the film wash over us, but even with all our cynicism we do invest in Bond and the people around him. Daniel Craig is beginning to rival Dalton for the title of Best Bond, continuing the intensity he cultivated in the last two films and really showing the strain of the character. Javier Bardem may be more pantomime than his performance in No Country for Old Men, but he's still intimidating, and his introductory shot is one of the best in the series. Judi Dench remains compelling as M, and the film takes the time to show how her relationship with Bond has developed over the series. While Bernard Lee's M more or less stayed the same, her M has gone from calling Bond a "sexist, misogynist dinosaur" to some form of emotional kinship. Elsewhere Ben Whishaw impresses as Q, clearly drawing on Brains from Thunderbirds, and Ralph Fiennes is in his element as Mallory, though at times he tips over into his performance is Victor Quartermaine in Wallace & Gromit: The Curse of the Were-Rabbit. 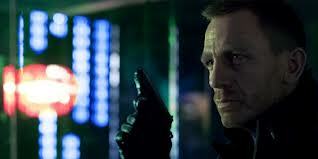 Skyfall is a highly enjoyable and technically impressive way to mark 50 years of James Bond. It's nothing like as ground-breaking as has been claimed, with all the clichés of the series being celebrated in amongst the subterfuge. But as a genre piece in and of itself, it delivers on almost every level, thanks to the believable central performances and Mendes' assured direction. The only question that remains is whether these high standards can be sustained. There’s a lot of the old-school stuff here for Bond that will make die-hard fans go insane, but a lot of other cooler, newer stuff as well that definitely has me more amped up to see where this franchise takes itself. Good review Daniel.